Pat O'Toole will be giving a presentation to the SMA (Stage Managers Association) about Mental Health First Aid "Must The show always go on?" Pat O’Toole will be joining speakers and participants at PLASA this September talking about The Charter and Supporting students and professionals in Production and Backstage industries. 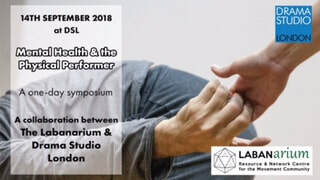 We are excited to be part of The ‘Mental Health and The Physical Performer Symposium’ hosted by Drama Studio and Labanarium on September 14th talking about the Charter in action. ​Exciting news from the #Time4Change team! Annemarie Lewis Thompson was invited to go to The Houses of Parliament to talk about mental health in the Arts and about The Charter along with Equity. In July this year Pat O’Toole from Rose Bruford College facilitated a day with practitioners, tutors health care professionals and coaches around implementing workshops in all Arts Training Colleges and Schools around Mental Health as part of Professional Development Work.